A great light alternative to Pumpkin Pie! For the Cake: Preheat oven to 350º F.
In a medium bowl add the confections sugar, cake flour, salt, nutmeg, cinnamon and ginger. Whisk until combined. Set aside. In the bowl of a standing mixer fitted with a whisk attachment, add egg whites and beat until foamy. Add the cream of tartar and beat until whites are opaque and soft peaks form. Gradually add sugar, while beating until whites are thick and shiny and medium peaks form, peaks should slightly droop over gently. Sprinkle 1/2 of flour mixture over the whites. Using a rubber spatula, gently fold flour mixture into whites. Repeat with remaining flour mixture. In a medium bowl mix, the pumpkin and vanilla. Then mix 1/3 of the egg white mixture into the pumpkin to lighten pumpkin mixture up. Fold the pumpkin mixture back into the remaining egg white mixture, and continue to fold until fully combined. Be careful not to over mix. Transfer batter to a ungreased tube pan and place in the oven. Bake the cake until golden and springy to touch, about 50 minutes. Remove pan from oven and immediately invert pan onto baking rack, allow to cool completely. Gently tap bottom edge of pan on work surface while rotating pan until cake loosens. For the Caramel: In a medium saucepan add sugar and water. Gently boil, over medium-high heat until sugar dissolves. Cook until syrup is a deep amber color, occasionally brushing sides of pan with a wet pastry brush and swirling pan, about 5 minutes. Remove pan from heat and carefully add cream. Place pan over low heat and stir until caramel bits dissolve and sauce is smooth. Remove from heat and add butter, salt, cinnamon and nutmeg. Stir until butter is melted and fully incorporated into caramel. Set aside. For Whipped Cream: In the bowl of a standing mixer fitted with a whisk attachment, or in a large bowl, add heavy cream, vanilla and sugar. Mix on medium speed, or beat by hand using a whisk until soft peaks form. Set aside. 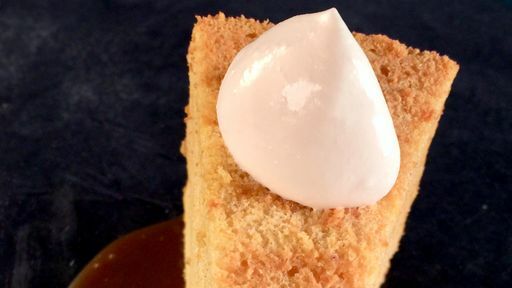 To Serve: Place caramel sauce on a plate, top with a slice of angel food cake and garnish with a dollop of whipped cream. Tip: Crunched for time? Substitute the caramel sauce with a store-bought caramel to cut down on cooking time!